who will receive your ParcelPush? The majority of Australian adult internet users (62 per cent) purchased a good or service online in the six months to April 2011. 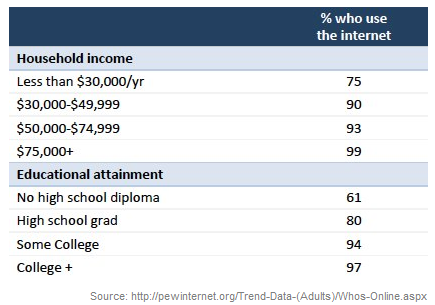 Australian Internet users aged from 35 to 44 were more likely than any other age group to have shopped online. as their young cohorts a Nielsen study from 2012 finds. Baby Boomers make the most money and they spend what they make! Yet less than 5% of advertising is geared toward this lucrative segment. ParcelPush targets this cohort for you through insert marketing campaigns. ParcelPush distributes your flyers or samples within eCommerce deliveries targeting a highly attractive customer segment: Online Shoppers! Who is online in Australia? 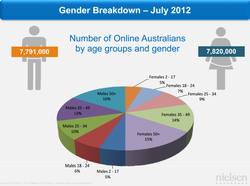 1.5m Australian men and 1.6m women are already online and spending 95 hours online. 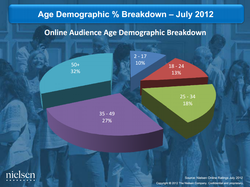 Many of the ecommerce deliveries of ParcelPush partner retailers will target this demographic for you. 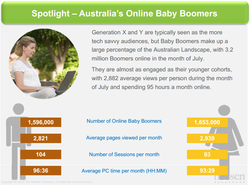 Males age 50+ and Females age 50+ represent the two largest online consumer segments in this Nielsen study from 2012 about the Australian Online Landscape. 32% of online shoppers already represent the lucrative 50+ segment and 27% are aged 35-49, which is a high income segment as well.